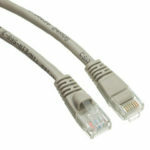 Small, efficient, fits in a pants pocket, and tests CAT5 RJ45, RJ12 and RJ 11 cables and cable runs. 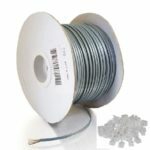 Unlike bringing an extra cable along for the printer that’s acting erratic over the network, cables running for hundreds of feet in conduit can’t easily be replaced. Testing their continuity is essential. If you make your own cables, this is also a great insurance policy in a box, costing less than $10 that proves you’ve done it right. 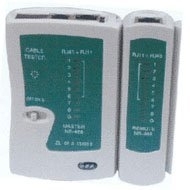 Put cables into both main tester and remote tester. The lights of the main tester will turn on sequently from 1 to G.